Sorry, CM... been busy doing some other stuff and not wanting to kill my system just yet . I was able to beat my previous score a while back and submitted it to hwbot. Maybe I'll give it another shot, but I think my RAM is holding me back. I am a little afraid to OC it as it's not the greatest RAM, and I can't afford more for another couple months. Updated! Previous 32m score from that system has been replaced with the new one. Perhaps having 6 sticks is a bit too tough on the system? Try with 3 sticks and push the frequency higher? just a heads up, HWBot only accepts wPrime v1.55 results as valid and yours appear to be with the newer v2.00. they can be removed if reported. just guessing on your version you are using based on the verification link. ... Lame. 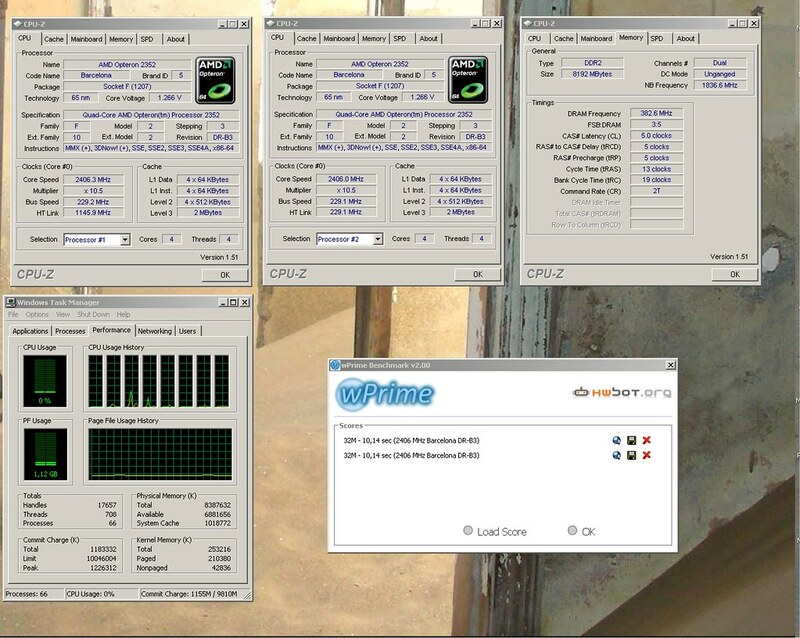 But still, wPrime is newer, sleeker and actually detects certain systems (like mine) better than 1.55. But as I mentioned a few posts again, I'll accept results from either. Updating the title thread now. I am only using 3 sticks, but I'm a little hesitant to push them too hard. From what I hear it's not really very good RAM. Thanks, 3oh6, I wasn't sure about that. When I tried to submit from the hwbot site it said 1.55 only, but submitting straight from 2.0 worked. I'll try again with 1.55 later. RAM: 12GB unbuffered ECC, 6x2, DDR3-1066. Needs some tweaking, I think I could do better. Decided to leave my old post for posterity. Same specs, a little tweaking managed to pull my 32M score down, but made little difference on my 1024M score. OCLed Nforce 3600 board 2352 B3s@2407 €100 per pair on ebay. running at 2407 because it is a very warm day today 30 degrees C and up. ^ have to assemble the server above to get screenies with cpu-z so this will take some time. Last edited by twobombs; July 4, 2009 at 11:17 AM.